Servers | KGS | Threeye 8d returned with his unique style! Threeye 8d returned with his unique style! Old KGS players should remember Threeeye 9d a strong player who often played a very unusual opening starting with 3 stones in the middle of the board. Alexander Dinerchtein reviewed one of his games in 2006 for go4go members. 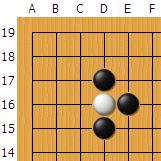 I remember another player redpoint 9d who used the same fuseki as black. Threeeye 9d played in 2005-2006 on KGS being one of the strongest players at that time. A new account Threeye (not Threeeye) was registered on KGS on July, 2009. His first game as black he used the same fuseki as Threeeye 9d so I suppose it's the same player. He reached 8d quite easily, losing only one 2-stones game to eastwisdom 6d. I'm looking forward to see him playimg as black using his unusual opening.